This post about shows you how to handle large neodymium magnets safely and sometimes test their power just for the fun of it… we were often asked what neodymium magnet would be good for a beginner who would like to try the power of neo-magnets but has no experience with their power. In this post, we will try to answer this question based on our experience as the best Customize NdFeB Magnet Manufacturer. We don’t believe there is such a thing as a perfect beginner magnet that will suit you all. But we will set up some guidelines for what beginner should look for. Well, neodymium magnets are simply, and the most powerful permanent magnets ever invented. Only electromagnets can be stronger so if you have had fun with weak ferrite magnets you’ll most likely love neodymium magnets. However great power comes with great responsibility. 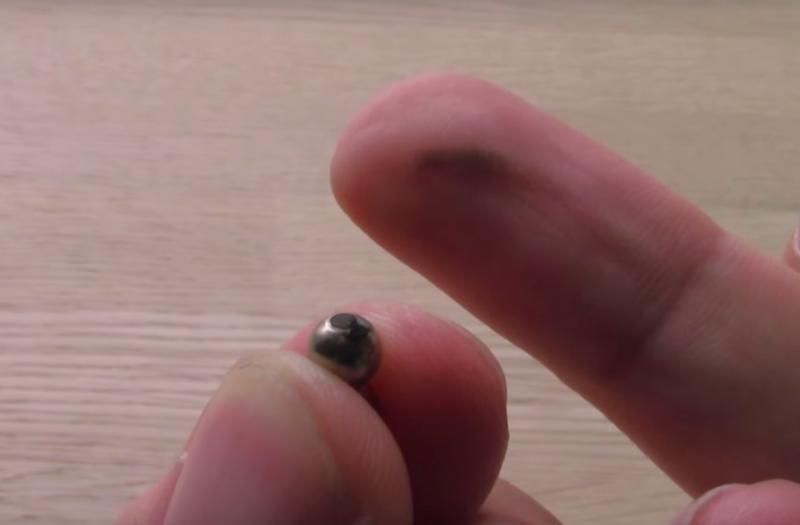 A large neodymium magnet is dangerous. The big ones can easily crush the bones in your fingers beyond repair. Ya, beyond repair, in another word means that the bone will be crushed to be small pieces. So you should pay attention to the large neodymium. That does not a toy. For that reason, the most important thing to consider when you want to buy a neo-magnet is “size”. Do not buy a large one as your first time. Practice with smaller magnets and scale up as you gain experience. Large neo-magnets are powerful and expensive. So buying one as a beginner is like taking your driving license in a Ferrari. It could be fun but will most likely quickly end up being very expensive and bloody. So how big is large in this context? It may be smaller than you think. 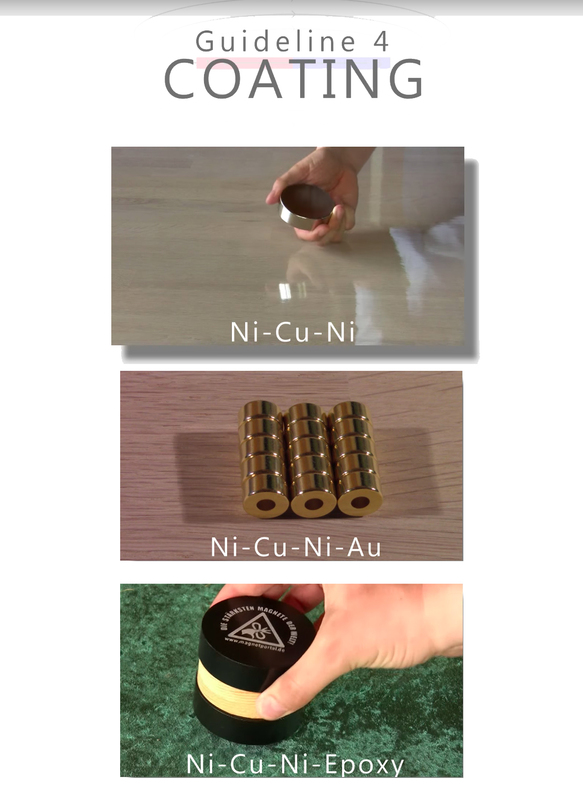 This is a 20 mm cubed neodymium magnet. It doesn’t look scary but this is more than enough to give you a nasty bite. In the past post, we showed how this magnet can lift over 20 kg. Imagine having skin pinched between the magnet and a solid metal bar. A 20 mm cube will easily give you blood blisters or even bite skin off. It will however not break your fingers but this magnet is the largest we can recommend for a beginner. If you’re not a responsible adult or don’t like the pain you should start smaller. This magnet is more controllable but still large enough to do some weight lifting. A typical fridge magnet will not lift 8 kg. 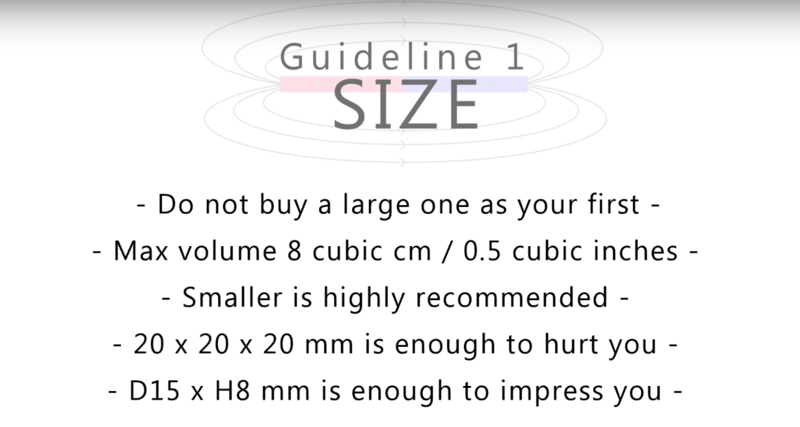 So to sum up about size: buy smaller than you think and train yourself before going large. 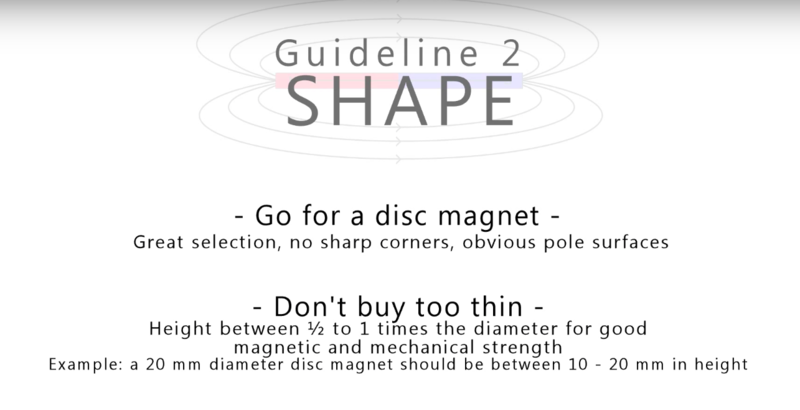 The next guideline is about the shape of a nice beginner magnet. There are a lot of shapes to choose. But we are only gonna show you the most common. Stay away from the more specialized shapes not shown. A beginner magnet should be simple, cheap, easily available and easy to handle safely. Here’s a common sphere magnet This is not recommended for a beginner. They are more difficult to produce than common shapes, so that is why their price is more expensive. The poles are just tiny dots on the surface so they don’t have impressive lifting force. There’s simply not much magnet touching the material you want it to stick to. This also makes them self-destructive. There’s a lot of force on a tiny area on the poles so the coating will over time crack or wear off. The magnet will then corrode rather fast so sphere magnets need special handling and storage. Here we have two disc magnets of roughly the same volume but we would prefer the thick magnet to the left. It is mechanically stronger and less prone to break in half. In practice, it will also feel magnetically stronger on small objects like a paperclip because there’s more magnet under each point on the pole surface. Okay, so a cube magnet would be a nice starter magnet? No… we do love cube magnets. They are our personal favorites but they are not nice beginner magnets. They still have sharp corners that bite hard and you can’t tell where the poles are with the naked eye. This can get you into trouble. Here are two cube magnets put together. And then let’s see what happens when we try to turn them around. Here it is in slow motion. Notice how close we was to getting our skin pinched. It happens way faster than we can react. The problem was that they were not put together pole to pole like shown here with the south pole marked with blue. They were instead put together side to side like shown here. This should not be twisted but the magnets come unmarked from the factory so a beginner may mess it up. Not pleasant with 20 mm cubes like these. Therefore our recommendation goes to the disc magnet as the best shape for a beginner. No sharp corners, poles are easy to spot and it is a very common shape with a lot of sizes to choose from. Perfect! Next up is the grade of the magnet. we have written a post about the magnet grade so we are not going to go into details about that. But all you need to know is: the higher number in grade the stronger the magnet. The higher grades are more expensive but since a beginner should look for a small magnet. we will recommend a medium to high grade. In smaller magnets, a higher grade does not add much to the price. 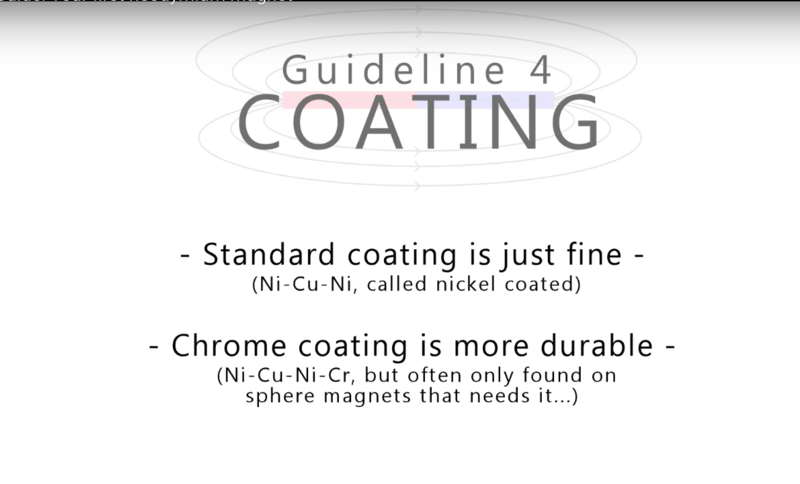 The last guideline is about coating and this is the least important. The standard for neodymium magnets is a triple-layer coating of nickel-copper-nickel. This is good for a beginner magnet. There are other more advanced options but you don’t need them and other coatings limit the selection of magnets and often add to the price. For example, you can find some with the fourth layer of gold. It looks great but it doesn’t make the magnet perform any better. So no need to go for the more specialized coatings. Alright, that was our guidelines for choosing your first magnet. But where can these magnets be bought? we haven’t heard of a dedicated shop where you can walk in and pick up a selection of neodymium magnets off the shelves. It would also be a nightmare to handle. we did however find a few neodymium magnets for sale in a physical shop in the section with whiteboards but these offers are generally of low grades N35 or so to keep them as cheap as possible. They can be an easy and fast solution if you just want to give neo-magnets a try but if you want a large selection and some strong grades you should search for dedicated web shops. But then you run into another problem. The shipping is expensive for a single magnet. They need to ship it as a package. They can’t just ship it in an envelope because it may get stuck to something before arriving at your place. And web shops have a minimum value that you have to order. They simply lose money if your order is only a single 50 cent magnet they have to spend time on handling and shipping. Fair enough. So for a beginner, we can recommend a sample selection of magnets which some web shops offer. Here are the best sets we found so far. Unlike other sample sets, I’ve seen these don’t just come randomly stacked in bubble wrap but in boxes with foam inserts. we really like this organized solution. This is the set with tiny magnets. A great collection but too small if you are aiming for a lot of power. The medium set is more powerful and may be the best choice for most. But for the same price, you can get the set with larger magnets. This set includes some nice disc magnets and is highly recommended – just be careful when removing the magnets. They are packed a little closer and may attract each other if you’re not aware when lifting a magnet out of the foam. Pull the magnet straight up and away from the other magnets. Oh! By the way… This set is called the macho set and it is not for beginners. Hopefully, this will all help you into the world of neodymium magnets without too much pain. Feel free to ask questions if you’re still in doubt.